The classic guide to raising your bottom line with the perfectcompensation strategy-fully revised and updated!Sales compensation WORKS!Nothing motivates a sales force better than apowerful compensation program. And whenyour salespeople are motivated, revenue soars. Buthow do you design a program ideally suited for yourbusiness strategy and organizational needs? It'sa delicate balance that makes all the differencebetween profit and loss. More and more sales leaders have turned to Compensatingthe Sales Force to help them discoverproblems in their present system and create a compensationprogram that works best for their needs. Now, in the second edition of this authoritative,jargon-free handbook, sales compensation guruDavid J.
Cichelli brings you completely up to date onsetting target pay, selecting the right performancemeasures, and establishing quotas. He suppliesclear guidelines for building the right compensationplan for any type of firm, of any size, in anyindustry, and he offers step-by-step procedures forimplementing each approach. 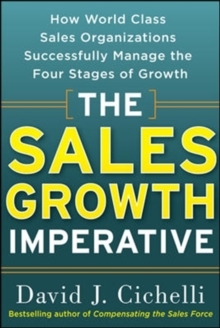 In Compensating the Sales Force, second edition,Cichelli has substantially expanded the book'spopular formula section, and he provides brandnewexamples of:Income producer plansSales rep commission plansBonus plansIncentive plansBase Salary management plansThe book also includes all-new chapters for global,complex sales organizations and hard-to-compensatesales jobs. Using the lessons in Compensating the Sales Force,you'll construct and calculate accurate formulas forpayout purposes and establish highly efficient supportprograms, such as sales crediting and accountassignment. 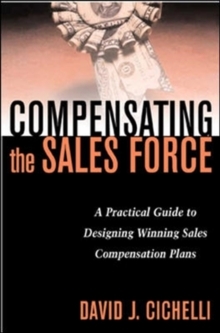 Complete with dozens of real-world examples thatillustrate important points and demonstrate specifictechniques and procedures, Compensatingthe Sales Force provides all the tools you need todesign and implement a sales compensation planthat maximizes profits-and keeps them climbing. 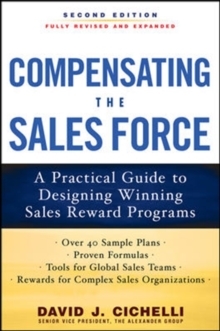 With brand-new chapters on GLOBAL SALES TEAMS amd COMPLEX SALES ORGANIZATIONS!Praise for the first edition of Compensating the Sales Force:"If your company is refocusing its efforts on sales revenueenhancement, you must read this book. If you want motivatedsalespeople and superior sales results, act on its content. 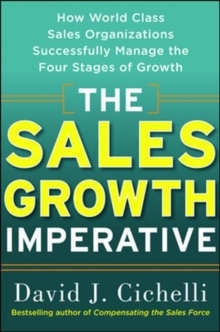 "Noel Capon, R.
C. Kopf Professor of International Marketing,Chair of Marketing Division, Graduate School of Business, Columbia University"This book provides great guidance for any business leader who wants to capitalize on salescompensation as a tool for driving business results. "Rick Justice, Executive Vice President, Worldwide Operations andBusiness Development, Cisco Systems"Dave Cichelli is the premiere sales compensation educator today.